Thảo luận trong 'ENGLISH' bắt đầu bởi Richard Lackey, 10/11/18. From a design perspective the QooCam is one of the most exciting consumer VR cameras to hit the market. It has a unique twisting hinge that allows the camera body to transform from 360 mode to 180 3D mode very quickly. It has won both iF design awards and CES innovation awards in 2018. The camera has a good weight to it, and feels solid. 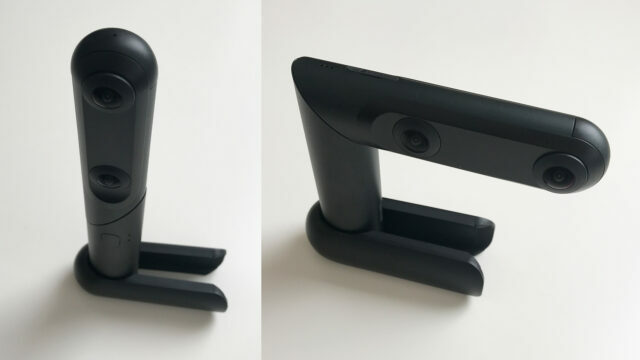 The metal body of the QooCam is finished to a high standard and the hinge feels strong with a good positive lock into either position. The QooCam is minimalistic in design and purposeful with only the necessary buttons and indicators. Some users have reported problems with the mounting thread in the base of the camera, and Kandao have begun shipping a new reinforced base to affected users. I really appreciate the look and feel of the QooCam, it feels like a premium device and handles easily. Mine didn’t ship with a selfie stick, so I had to use one I already had. This proved to be helpful as the camera is just too close to the user otherwise, especially when recording 360 material. I believe the selfie stick should ship as standard with the camera. It’s important to get the camera up and away from you as much as possible and this isn’t possible holding the camera body. The camera comes with a protective sleeve that slips over the lenses, it can also act as a base to support the camera vertically on a stable flat surface, it’s better than other cameras I’ve used with a similar concept. The only criticism I have of the QooCam design, is that the small plastic covers for the microSD card slot and micro USB port sit flush with the camera body and are difficult to pry out the first few times, but then become easier. 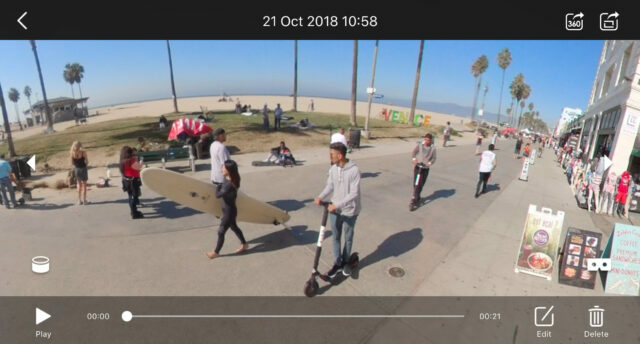 I have to say, I’m impressed with the image quality, sharpness and resolution of the video and photos recorded by the QooCam. While there are cameras recently introduced such as the Vuze and the new Insta360 One X that record 5.7K resolution, the QooCam creates 4K (UHD) files, but in my opinion it is superior to other 4K VR cameras such as the insta360 One. The final recorded image is dependent on a lot of processing and stitching, so developments and improvements in software can give a camera an edge beyond just sensor pixel count. Software is increasingly able to intelligently and contextually enrich and enhance limited image sources, filling in some gaps in missing or noisy source image data. This will become increasingly true as computational image processing becomes even more effective. The sensor is important however and this aspect is still where these consumer level cameras fall short. They all suffer from limited dynamic range, which is to be expected of a phone camera size image sensor. As with all of these cameras, and smartphone cameras for that matter, this is especially obvious in bright, clear conditions around the sun, and in high contrast situations. The only way to improve this is for the manufacturers to start using much larger sensors (1″ and up) with higher color bit depth processing and recording. This is already the case for professional level VR cameras of course at a much higher price point. Having said this, while considering Kandao’s entire camera line up, they are market leaders in VR and have employed their considerable computational imaging prowess to good measure in a consumer camera. The QooCam is up there with the best in terms of image quality. The workflow for the QooCam is quite straightforward. For my example videos, I chose to process my video files in the desktop app, QooCam Studio. I was able to batch render a folder of files, applying stabilisation and rendering 4K 60Mbps files that are then easy to edit in any NLE. The QooCam app is available for iOS and Android. It provides control over camera settings, and a live preview which is very useful. The phone connects to the camera with wifi, which does mean you can’t be connected to a different wifi network for internet at the same time. I do however prefer this to bluetooth as it provides a more robust connection and the higher bandwidth required to stream a live preview. Switching between 180 3D and 360 mode is as simple as physically twisting the hinge on the camera, and both the camera and app recognise the switch and adjust. The camera settings are simple and straightforward. You can switch the camera between PAL/NTSC frame rates, format the SD card in the camera, and perform a firmware update. The video settings you can change are the video export bitrate, up to 60Mbps, and change timelapse between recording photos and creating a video. When in camera live preview, you can easily switch between photo, video, timelapse and “dng8” recording modes, and each of these modes has further camera settings. These including switching auto/manual exposure, EV, auto/manual white balance, and resolution/frame rate. The video resolutions and frame rates available are 4Kp30, 4Kp60, 2Kp100 and 2Kp120. When in photo and timelapse modes you can set the format to jpg or jpg + dng. I didn’t spend too much time with the QooCam app outside of camera control as I rarely do any kind of post with my phone, and I don’t post direct to social media. However, the option is there if you need it. 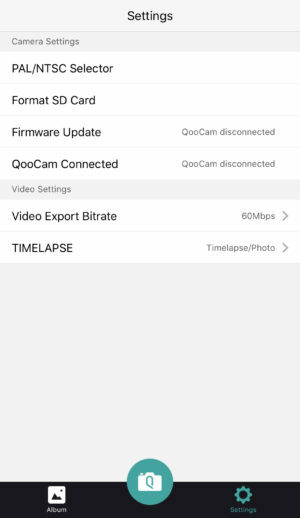 The QooCam app provides a library with access to files on the camera (when connected over wifi), files that have been downloaded from the camera to the app, and edited files. Downloading files from the camera is simple, you just select them and download to your device, allowing you to work with them offline in the app after the camera is disconnected. 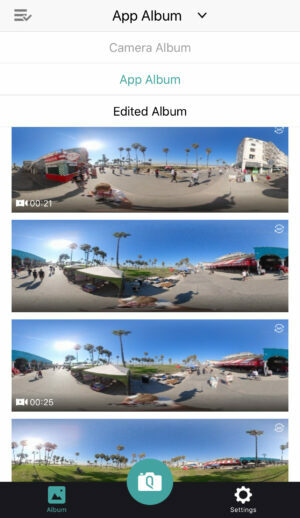 You can edit 360 and 180 3D photos in the app easily, change the projection, and export 360 and 180 3D photos for social media or create screenshots of crops and tiny planet photos quickly, saving them to your phone photo library or post direct to instagram and facebook. Very intuitive, fast and easy to use. The QooCam app allows you to trim 360 and 180 3D video clips, exporting them to your phone photo library or post direct to social media. It also provides overcapture so you can save a 16:9 crop from a 360 video and keyframe points of interest so the camera view moves around. You can’t edit multiple clips together into a single compiled video, so the app doesn’t provide a full editor in that sense, but once processed, the video files are standard 3D 180 or 360 format and can be edited in any NLE. QooCam Studio is a basic tool for batch processing and rendering 3D 180 and 360 video files. It stitches the two camera views and allows you to make adjustments for yaw, pitch and roll. You can also select between anti shake and full stabilisation, and enable or disable color correction. It’s easy to use and gives you exactly what you need to pre-process files for editing. There are a few ways to use the QooCam. You can shoot video or photos in 2D 360 or 3D 180. 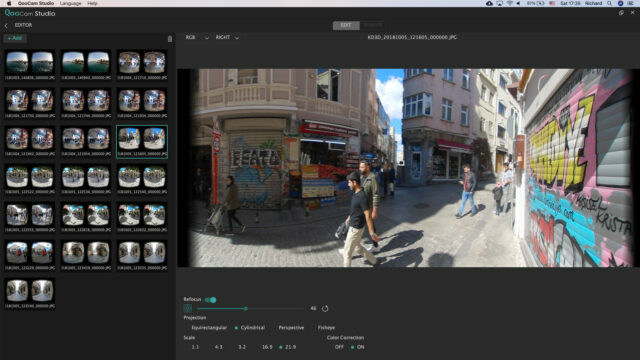 Since I was using the QooCam for the first time, with the specific purpose of writing a review, I chose to concentrate on 3D 180 while I was in Istanbul, and 360 while I was in L.A. a couple of weeks later. However, it’s really easy to switch between recording 180 and 360 on the fly, and between videos and photos. The learning curve for the QooCam is easy, in fact it is easier to use than other 360 cameras I have. Much of this is down to the app, it really doesn’t get in the way, and it doesn’t try to integrate you into an online community, or bombard you with notifications. I prefer not to be in my 360 videos, which is impossible unless you can set up the camera somewhere and leave it. In this case I didn’t want anyone to steal it, so you’re going to see a lot of me in the 360 video. This is one of the things I like most about shooting 180 VR, as you can still stay behind the camera, and hide the shadow of the camera itself. While I am mostly interested in VR video when it comes to these cameras, and this was the main focus of my testing, the Kandao QooCam is the first I have used that generates a depth map in 180 3D mode and allows refocus in post. This is clever, and it’s nice to see it implemented in a small handheld camera at a consumer level. How it stacks up against similar tech in various smartphones would require a specific comparison test, and that’s beyond the scope of this review. It is worth mentioning however that the QooCam provides a full 180 degree field of view with a depth map, whereas smartphone 3D photos are significantly less. Above is a 2D cylindrical image output from the right camera only after refocus. The QooCam Studio application only processes 3D jpg images, which is a shame as the dng raw images may produce a significantly better result. There is also a DNG8 mode for photos which actually shoots 8 different exposures which can be combined to produce an HDR image. The ability to live stream from the QooCam is available now from the QooCam Studio desktop software on Windows only at this time. Testing this is beyond the scope of this review but it is a feature worth mentioning. Camera is a little bit close when holding by hand, a selfie stick is definitely a must have accessory. Should You Buy the Kandao QooCam? In conclusion, if you are looking for a user friendly, well built VR camera to create content intended for social media, that will mostly be viewed on small screens, the Kandao QooCam is tough to beat for the simple reason that it gives you 3D 180 and 2D 360 VR in a single device. Image quality is adequate for social media posts and it won’t get in the way of capturing the scenes and moments you want to share. Is it capable of professional or commercial quality? No, but for what it is, and how it is intended to be used, it ticks all the boxes. Do you have a Kandao QooCam? Are you thinking of buying one? Let us know your thoughts in the comments. The post Kandao QooCam Review and 3D 180 / 360 Video Samples appeared first on cinema5D.